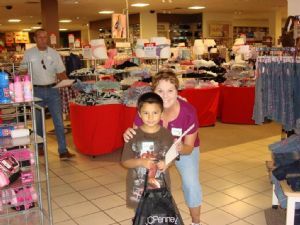 Ft. Yuma Rotary helps 30 children shop for back to school clothes at J.C. Penney on August 1st. The youth (ages 5 - 16) were selected from Salvation Army, Boys & Girls Club, Amberly's Place, Crossroads Mission, Child and Family Services and Arizona Children's Association. JC Penney helped with great sale prices, an additional 15% discount plus $10 off. After shopping, the kids went to the Boys & Girls Club (Yuma). Salvation Army provided school supplies and breakfast for the kids and volunteers. Cost Cutters (Ave B) and Suzanna's Family Haircutters provided free haircuts and Sam's Club Optical provided free eye exams for the children. The Food Bank provided backpacks for each child. They are ready for school to start!